Computer Science for Georgia (CS4GA) is a collective impact effort by diverse stakeholders to bring quality CS education to all children in K-12 systems throughout Georgia’s 182 school districts. 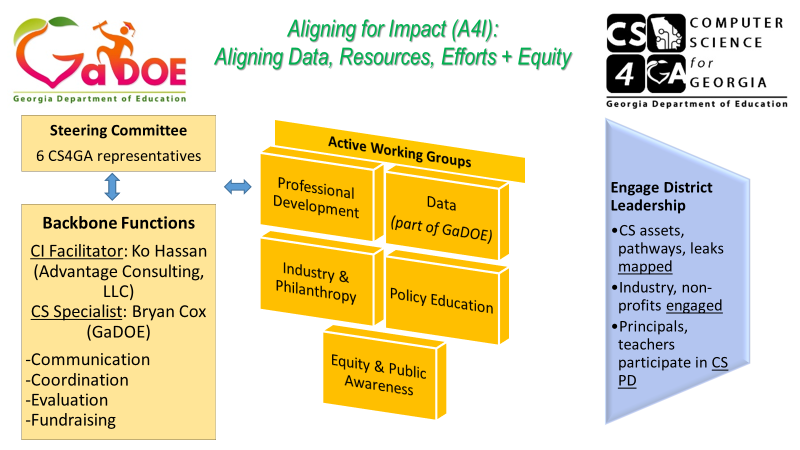 CS4GA has utilized the collective impact model to bring together stakeholders from all relevant sectors: school districts, industry, universities, philanthropy, state government, and others. CS4GA will ensure that underrepresented groups in particular receive the support they need to fully participate in CS education. Our goal is to have quality CS education for all children in Georgia. Many Georgia schools suffer from pervasively low literacy and numeracy achievement. Efforts must intentionally address the needs of minority students in relation to stereotype threat, complex self-identities, lack of CS role models, and perceptions of fit in CS and technology. Better promotion and understanding of the diverse careers and content within CS and technology must be achieved. Largely, school infrastructures do not allow the flexibility to infuse CS and computing into ongoing systems. Creative approaches to CS curriculum integration will be needed to ensure CS is not just “the next new thing”. How will CS4GA expand access to quality K-12 CS education? CS4GA will be working with its partners to expand quality teacher professional development to as many schools as possible. Our current focus is on working together to define what is meant by a ‘quality CS education’ and determine what our current professional development opportunities do to help us achieve ‘quality’. Based on demand for teacher PD from around Georgia, we will work together to raise funds to provide teacher PD to as many teachers and school districts as possible. We are particularly focused on ensuring that children who traditionally have not had access to a quality CS education will benefit from our CS education initiatives. We invite individuals, leaders from all sectors to help us reach all of Georgia’s children with quality computer science education. 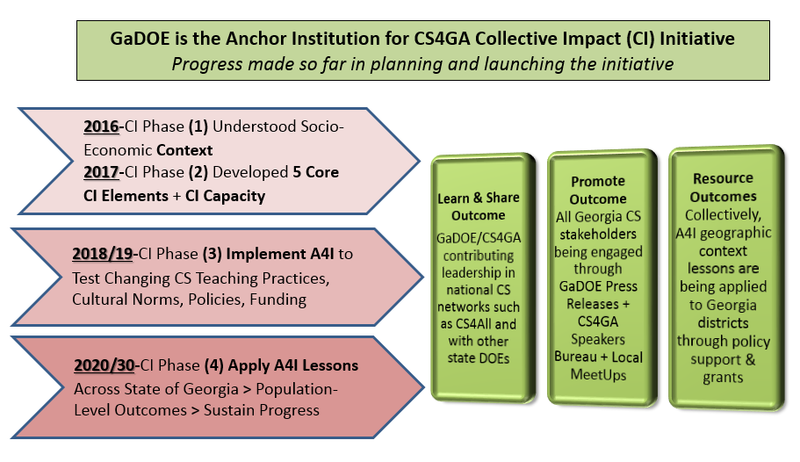 Georgia’s Department of Education (GaDOE) has provided leadership by offering to serve as the ‘anchor’ institution of the CS4GA collective impact initiative. Dr. Caitlin Dooley serves as the lead GaDOE representative for CS4GA. Mr. Bryan Cox is GaDOE’s Computer Science Specialist and assists Dr. Dooley in coordinating the CS4GA initiative. Mr. Khurram “Ko” Hassan of Advantage Consulting, LLC is assisting GaDOE with facilitating CS4GA meetings and providing the collective impact planning leadership necessary to engage all interested CS4GA members. Who can be part of CS4GA and what is its structure? Dooley, Mr. Bryan Cox, and Mr. Khurram “Ko” Hassan are the lead individuals providing ‘backbone’ function support to the CS4GA collective impact effort. No collective impact effort can succeed without someone providing the communication, coordination, facilitation, fundraising, and data management support. Through resources provided by GaDOE and funds raised through grants, CS4GA is able to have some support to coordinate its members planning efforts and begin to implement its initial strategies. Would you like to join CS4GA? Please use our CS4GA Membership Form to join in our efforts to expand CS Education for all children in Georgia.